You, our staff and faculty at the University of Wisconsin-Madison, dedicate countless hours to support research, teaching and public service at our incredible university. 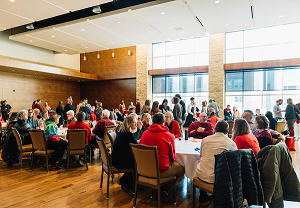 We, at the Wisconsin Union, are honored to serve a place where so many of you hold classroom discussions, meet with fellow team members, and enjoy leisure time with family and friends. You likely already know that you have some Union benefits as a staff or faculty member, such as access to our art galleries and free film showings and the ability to join the Wisconsin Hoofers, but becoming a Wisconsin Union member is the key to opening up all the ways for you to make the most of the Union. Let’s start with the free stuff. Yes, with Union membership, you get even more free things, including unlimited access to our free events, including lectures by internationally known speakers; free art classes the first Friday of every month; and even free meeting room rentals for personal use at Memorial Union and Union South. On Feb. 11, the Wisconsin Union invited Union members to an exclusive appreciation event called “Hearts and Drafts”. This annual member-exclusive event featured delicious pairing of several craft beers with fine chocolates. membership team, who is dedicated to serving our incredible members. Plus, when you become a member, you’re helping provide UW-Madison students with thousands of leadership opportunities throughout the year. How? Well, more than 2,300 Union events are created, planned and implemented by Union student leaders. That concert you attended on the Terrace? Students helped make it possible. That film you saw for free at the Marquee in Union South? It was picked by students. The Union may not look like a traditional lecture hall but is, actually, a multi-building learning laboratory. 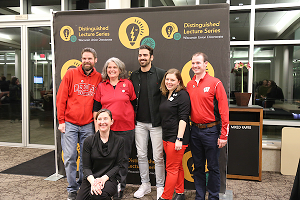 The WUD Distinguished Lecture Series Committee and the McBurney Disability Resource Center presented ‘Living Out Loud: An Evening with influential leader and ambassador for the deaf community Nyle DiMarco’ on Jan. 30 at Memorial Union. If you’re on the UW-Madison team, we already know you’re committed to helping students and to doing your part to encourage sifting and winnowing. When you become a member, you’re extending that service leadership commitment and touching the lives of students beyond the classroom. When people think of a college union, undoubtedly, they think of a place where students go to hang out, eat, study and have fun. And, sure, we are definitely all of that and happy to serve in all of these ways. But we’re also more. We’re a community union. When you walk through our buildings, you’ll see staff, faculty, students and community members, and we think that’s pretty special. It’s a chance to bring different perspectives and experiences together and be a place for rich, engaging dialogue on every topic imaginable. We are so glad you are part of the university family and hope you will join the Union family, as well. For the first time in the Union’s more than 110-year history, in honor of all that you, our staff and faculty do for our university, we are offering you a discounted lifetime membership. To become a membership you can make four annual payments of $55 for a total of $220 (a 20 percent discount from the community membership rate) or a single payment of $200 (a 27 percent discount from the community membership rate). For more information or to purchase a membership, you are welcome to visit union.wisc.edu/membership or email us at membership_union@wisc.edu.